¶ 1 Leave a comment on paragraph 1 0 As already explained, OER are not just materials that have been specifically designed for educational purposes, as any resource that complies with the 5R permissions is amenable to become OER, as long as someone finds it of value for teaching or learning. This means that many useful resources are not labelled as OER. Thus, learning to find Public Domain and openly licensed resources is the first thing educators who want to use OER need to do. In addition, there is a growing pool of projects and sites specifically devoted to sharing and enabling the remix of OER, some of which will be reviewed later this section. ¶ 2 Leave a comment on paragraph 2 0 Some search engines offer the possibility of filtering results by usage rights, so it is possible to submit queries that only return content that can be modified and shared. ¶ 3 Leave a comment on paragraph 3 0 For example, Google Advanced Search allows users to restrict results to just content that can be used, shared or modified, even for free. 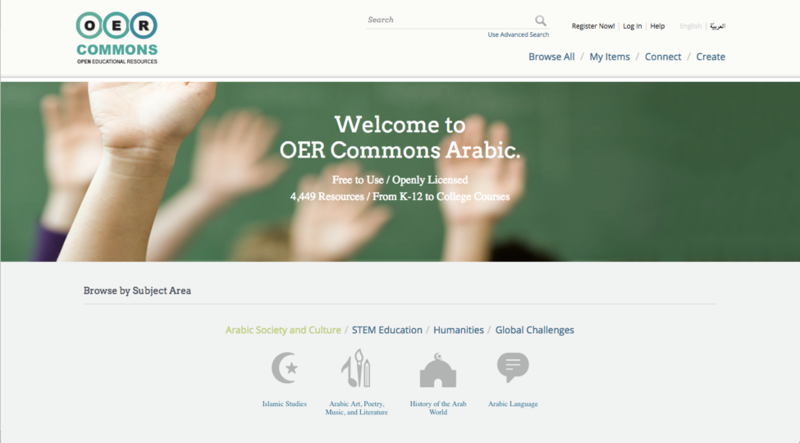 Another useful feature is that you can also filter by language, so you can specifically retrieve OER content in Arabic, or any other language particularly relevant to you or your students and colleagues. Solvonauts.org has indexed more than 150,000 open resources from 1016 sites. ¶ 6 Leave a comment on paragraph 6 0 Below you can see some examples of websites offering different types of content and data available under Creative Commons licences or in the Public Domain, which you mind find of use in your teaching and learning. ¶ 7 Leave a comment on paragraph 7 0 Being one of the most visited websites worldwide every day and having most of its text and many of its images co-licensed under the Creative Commons Attribution-ShareAlike 3.0 Unported License (CC BY-SA) and the GNU Free Documentation License (GFDL), Wikipedia has been described as “the single greatest Open Education Resource the world has ever seen” (by Jim Groom in his keynote at the OER16 Conference). ¶ 8 Leave a comment on paragraph 8 0 Despite widespread concerns at universities about using it as a formal academic reference, due to the fact that anyone can contribute to it, Wikipedia plays an important role in the Personal Learning Environment (PLE) of many students (and academics). Rather than banning its use, institutions are starting to recognise its value as a learning resource, not as a source of information to be cited, but also by involving students in editing articles, enhancing the quality of content, and helping to improve areas of knowledge and topics that are underrepresented. Under the Wikipedia Education Programme many universities are already embedding the use of this encyclopedia, and other sister initiatives, into teaching and learning. ¶ 11 Leave a comment on paragraph 11 0 Whereas Wikipedia is the most popular project within the Wikimedia family, there are many other initiatives of Wikimedia Foundation that can be extremely valuable as OER, such as Wikimedia Commons, Wikidata or Wikiversity. ¶ 16 Leave a comment on paragraph 16 0 Wikiversity is a community for learners and teachers. ¶ 19 Leave a comment on paragraph 19 0 “In Wikiversity, you can find learning materials of all types to use yourself as self-study materials. If you are interested in learning about a subject, browse our content to see if there is anything that suits your needs. It would also be helpful if you comment on the materials you use, so that we can continually improve our resources. ¶ 22 Leave a comment on paragraph 22 0 “Wikiversity is designed to collect a range of learning materials for various uses. These materials are designed, not just for self-study, but also as material which can be used in your classroom. What we aim to provide is a way of searching for content easily, which can be printed/saved and used in class—as well as a lesson plan to guide you through this material. ¶ 25 Leave a comment on paragraph 25 0 A very interesting example of how Wikidata can be used to power other valuable initiatives for teaching and learning is Histropedia, which enables the creation of timelines by pulling data from Wikidata. ¶ 27 Leave a comment on paragraph 27 0 Over the last years many institutions, organisations and individuals have engaged in the provision of OER by developing repositories and collections specifically created with the aim of sharing and enabling the reuse of resources for teaching and learning purposes. In this sections we review a few well-known initiatives that might help you find useful resources. ¶ 30 Leave a comment on paragraph 30 0 OER Commons is a directory of resources linking to content produced by a wide range of projects and initiatives, offering a single point of access to more than 50,000 high-quality OER. It aggregates content from a wealth of well established OER providers, such as MIT OpenCourseWare or Rice University’s OpenStax College. The full list of providers can be consulted at https://www.oercommons.org/oer/providers. ¶ 33 Leave a comment on paragraph 33 0 A subset with more than 4,000 resources in Arabic is available as part of the project at https://arabic.oercommons.org. For further details consult the case study included in the OpenMed Compendium. ¶ 35 Leave a comment on paragraph 35 0 Another example is Teaching Commons, which gathers open-access textbooks, course materials, lesson plans, multimedia, lectures and other materials from colleges and universities. ¶ 36 Leave a comment on paragraph 36 0 OCW is a very specific model of OER provision that offers “high quality college and university‐level educational materials. These materials are organized as courses, and often include course planning materials and evaluation tools as well as thematic content” (Open Education Consortium). ¶ 37 Leave a comment on paragraph 37 0 Whereas the model was first developed at the Massachusetts Institute of Technology (MIT) in 2001, many other institutions have followed the same steps and launched their own MIT initiatives since then. ¶ 38 Leave a comment on paragraph 38 0 The Open Education Consortium (formerly known as OCW Consortium) has built a meta search engine that allows querying from one single point the OCW repositories of many institutions around the world, including MIT’s. ¶ 41 Leave a comment on paragraph 41 0 Several initiatives are specifically devoted to creating manuals released as OER. ¶ 42 Leave a comment on paragraph 42 0 OpenStax CNX, formerly known as Connexions, is an initiative launched as early as in 1999 by Rice University that currently offers “tens of thousands of learning objects, called pages, that are organized into thousands of textbook-style books in a host of disciplines” (https://cnx.org/about). educationally: We encourage authors to write each page to stand on its own so that others can easily use it in different collections and contexts specially designed for their students. technologically: all content is built in a simple semantic HTML5 format rich with built-in accessibility features to ensure it can all be read by everyone. Also the OpenStax CNX toolset makes it easy for author to create and adapt content using a word processor similar to Google Docs or Word. ¶ 45 Leave a comment on paragraph 45 0 The BC Open Textbooks project has released a considerable number of OER manuals adapted and created by faculty in the post-secondary system of British Columbia (Canada). The titles cover an extremely wide range of disciplines and topics. As an example relevant to anyone following this course, we recommend taking a look at the book Teaching in a Digital Age, by the leading expert in the field of education and technology Tony W. Bates. ¶ 46 Leave a comment on paragraph 46 0 The Community College Consortium for Open Educational Resources has identified a list of open textbooks in the following areas: Anthropology & Archaeology, Art, Biology & Genetics, Business, Chemistry, Computer Science, Economics, Education, Engineering & Electronics, English & Composition, Health & Nursing, History, Languages & Communications, Literature, Law, Math, Music, Philosophy, Physics, Political Science, Psychology, Science, Sociology, Statistics & Probability. ¶ 49 Leave a comment on paragraph 49 0 OTL is supported by a network of more than 50 institutions working to foster the adoption of open textbooks by lecturers in their teaching (http://research.cehd.umn.edu/otn). ¶ 50 Leave a comment on paragraph 50 0 Many universities and organisations have also created OER collections of video and audio recordings of talks by faculty or guest speakers. ¶ 51 Leave a comment on paragraph 51 0 For instance, the University of Oxford has shared thousands of podcasts featuring public lecturers and interviews with leading academics, as OER, by means of iTunes U and their own repository available at http://podcasts.ox.ac.uk/open. Content is available under the CC BY-NC-SA licence. ¶ 52 Leave a comment on paragraph 52 0 VideoLectures.net is a well-known repository of talks delivered by distinguished scholars at prominent academic events around all over the world. ¶ 54 Leave a comment on paragraph 54 0 While this is no doubt an extremely valuable source of educational content, it is worth noting that VideoLectures.net does not fit with the notion of OER as defined by the 5R permissions, given that videos are released under the CC BY-NC-ND, so users are not allowed to “alter, transform, or build upon the work” (http://videolectures.net/faq/). ¶ 55 Leave a comment on paragraph 55 0 Khan Academy is another example of a comprehensive collection on OER videos, which has evolved to include exercises, articles and a range of personalised learning tools. Rather than being an institutional initiative, it started with a single person – Salman Khan – recording video tutorials to help his cousin learn mathematics, and now it has grown to be an 80-person non-profit organisation. While not all the content is available as OER, most of the content on Khan Academy has been released under a CC licence that allows users to repurpose resources, as long as it is for non-commercial purposes. ¶ 56 Leave a comment on paragraph 56 0 “Can I use Khan Academy’s videos/name/materials/link on my site? ¶ 57 Leave a comment on paragraph 57 0 You are welcome to link to the materials on our website and in general, use the website offerings at www.khanacademy.org, as long as there is not a charge specific to using the resource (for example, if a tutor charges $20 per hour per student without Khan Academy but $30 per hour with Khan Academy, that breaks the noncommercial clause). ¶ 62 Leave a comment on paragraph 62 0 “The long-term goal of the translation project is to launch full-featured Khan Academy platforms in the world’s languages. The reason behind Khan Academy’s international efforts is to enable learners and classrooms all over the world to adopt self-paced, mastery-based learning through thoughtful use and implementation of the resources and tools offered for free on localized Khan Academy sites. ¶ 65 Leave a comment on paragraph 65 0 Apart from searching for OER through generic directories or collections, teachers and learners may also find relevant resources by consulting special collections of content devoted to particular topics, subjects or disciplines. Here, we have selected just a handful of projects that will give you a flavour of what a valuable thematic OER project or collection looks like. ¶ 66 Leave a comment on paragraph 66 0 School of Data is a network of organisations and individuals concerned with data literacy that have produced dozens of articles, lessons and hands-on tutorials on how to work with data. ¶ 68 Leave a comment on paragraph 68 0 All content is available under the Creative Commons Attribution 4.0 International License used by Open Knowledge International. ¶ 69 Leave a comment on paragraph 69 0 SmartHistory is a collection of videos and essays for the study of art history and cultural heritage with contributions from more than 200 experts (art historians, archaeologists, curators, etc. ), which has been created in collaboration with leading museums and organisations in the field around the globe – including The British Museum, the Google Cultural Institute, The Museum of Modern Art and Tate among others. The work is licensed under a Creative Commons Attribution-NonCommercial-ShareAlike 4.0. ¶ 70 Leave a comment on paragraph 70 0 Beyond the opportunity for learners to have access to educational content for free (e.g. textbooks, podcasts, courseware), some OER initiatives offer the possibility of assessing and certifying learning. ¶ 71 Leave a comment on paragraph 71 0 For instance, the UK Open University’s OpenLearn initiative offers around 1000 courses that are free to study and include ways of demonstrating achievements through assessed learning, which may lead to the issuing of statements of participation and digital badges. ¶ 72 Leave a comment on paragraph 72 0 “Once you have enrolled on an OpenLearn course and have completed it, you will be able to access and download an Open University statement of participation. ¶ 73 Leave a comment on paragraph 73 0 You can print or email this statement of participation to demonstrate your successful completion of a free online course and your interest in the subject, commitment to your career or to provide evidence of continuing professional development. ¶ 74 Leave a comment on paragraph 74 0 If you have successfully completed an OpenLearn course that carries a badge, the badge will also appear on the statement of participation. ¶ 76 Leave a comment on paragraph 76 0 Another example is Saylor Academy, an initiative of the Constitution Foundation that offers self-paced courses for free, including the possibility of earning certificates of achievement and in some cases even credit recognition. ¶ 78 Leave a comment on paragraph 78 0 All courses offered by the Saylor Academy have a final exam and learners who pass it are provided with a completion certificate. ¶ 80 Leave a comment on paragraph 80 0 Before the final exam, learners can check their progress by means of activities and assignments while completing a course. While both formative and summative assessment in Saylor Academy may help students in their learning, it is worth noting that the exams sat rely on automatic or self-grading. ¶ 82 Leave a comment on paragraph 82 0 While Saylor Academy is not an accredited institution and cannot grant credits, some of their courses might be recognised for credits by third parties, provided that students pass a proctored exam (https://www.saylor.org/credit/). ¶ 83 Leave a comment on paragraph 83 0 The issue of quality in OER provision – as well as in Open Access scholarship – has been part of discussions since the early days of the movement and it has implications from the perspective of providers as well as re-users. ¶ 84 Leave a comment on paragraph 84 0 Depending on the nature of practices, initiatives might involve more or less systematic approaches to quality assurance. For instance, an individual scholar might release content on her own personal website without going through any formal quality assurance process, the same way s/he can create resources for their teaching without any formal approval. In the case of institutional initiatives, there is usually some form of review process, though this is not always the case. ¶ 85 Leave a comment on paragraph 85 0 After reviewing a number of OER initiatives, the Open Educational Quality Initiative – OPAL Project (2009-11) identified ‘lightweight’ as opposed to ‘top-down’ controlled approaches to quality assurance, as well as models in between the two ends of the spectrum. ¶ 86 Leave a comment on paragraph 86 0 “QA models range from lightweight, user-defined models to strictly controlled hierarchical models. An example of a lightweight and user-driven model came from the Southampton University case study and their edshare project. They provided the option of either open-web sharing or institution-only sharing, according to academics wishes. The OER are made available as simple assets (such as Powerpoint, word, PDF files); i.e. standard formats that academics are used to producing in their everyday practice. In terms of QA and adherence to standards this is very much a lightweight approach, no adherence to IMS CP or LOM is required. OpenExeter is another example of quality control driven by academics, although interestingly it does adhere to IMS standards and is SCORM compliant. It is interesting to note that Southampton and Exeter would both view themselves as ‘research-focused’ institutions, where the academic view is still privileged; hence such lightweight, academic-driven approaches are to be expected. In fact, this does appears to be quite a common approach adopted by many of the case studies; certainly some of the more recent, smaller initiatives. ¶ 88 Leave a comment on paragraph 88 0 Teachers wishing to re-use OER in their teaching should get familiar with the quality assurance mechanism in place and assess the credibility of authors and institutions behind them, just the same way as it should be the case when dealing with proprietary resources. ¶ 89 Leave a comment on paragraph 89 0 The ExplOERer Course offers a set of questions, based on Achieve’s Rubrics for Evaluating Open Education Resource (OER) Objects (http://www.achieve.org/oer-rubrics), that aim to help teachers consider key aspects when evaluating the quality of OER. How thoroughly is the subject matter explained? Are the main ideas clearly identified for the students? Are materials comprehensive and easy to understand and use? Are suggestions for ways to use the materials with a variety of learners included? If interactive, is this feature purposeful and directly related to learning? Do materials engage students in working collaboratively, thinking critically and solving complex problems, learning how to learn, communicating effectively, etc.? ¶ 100 Leave a comment on paragraph 100 0 In any case, it is ultimately up to educators to decide whether a given OER (or any teaching materials at large) is suitable and meaningful to their students, based on aspects and features that are relevant to their particular needs.